Chicago is a great theatre town partly because it has the space to make work at a sustainable price point. With venues ranging from Soldier Field to a 40-seat store front in Rogers Park, there is a performance space for any kind of endeavor. Chicagoland has always been blessed with a steady march of purpose built theaters. The Studio Gang designed Writer’s Theatre in suburban Glencoe is the latest to join institutions like the modern Harris Theater for Music and Dance in Millenium Park and the historic Auditorium Theatre, which this year celebrated the golden anniversary of its reopening with a star-studded dance showcase. But Chicago is also a place that is constantly repurposing spaces to make them state of the art theaters. 2016’s entry for the most intriguing space story was the little Studio 5 carved from a storefront in Evanston’s Dempster Plaza shopping mall. By day, it’s a flexible dance studio. But on weekends, it’s a lovely and versatile small venue that features live streaming capabilities, acres of free parking and cutting-edge sound and electronics along with a dancer designed floor. However, 2017 will likely go down as a watermark year in theatre space recycling with the unveiling of the repurposed Navy Pier Skyline Stage—an aesthetically pleasing but completely impractical summer theatre in a town with 6 months of winter—now known as The Yard at Chicago Shakespeare. After experiencing three productions with three totally different configurations so far this season, it is clear to me that The Yard is the theatre of the future. Theatre designers and architectural engineers will join directors, actors and audiences in making a pilgrimage to the second city. Theatregoing is a full body experience. As we attempt to entice people away from their screens for a live event at a specific time, the entire evening becomes important. After all, 2017 was also the year where the online performing arts service Cennarium streamed the first ever, completely free international arts festival called Promenade, proving you can see amazing performing arts without leaving your house. The quality of the live experience has never been more important. 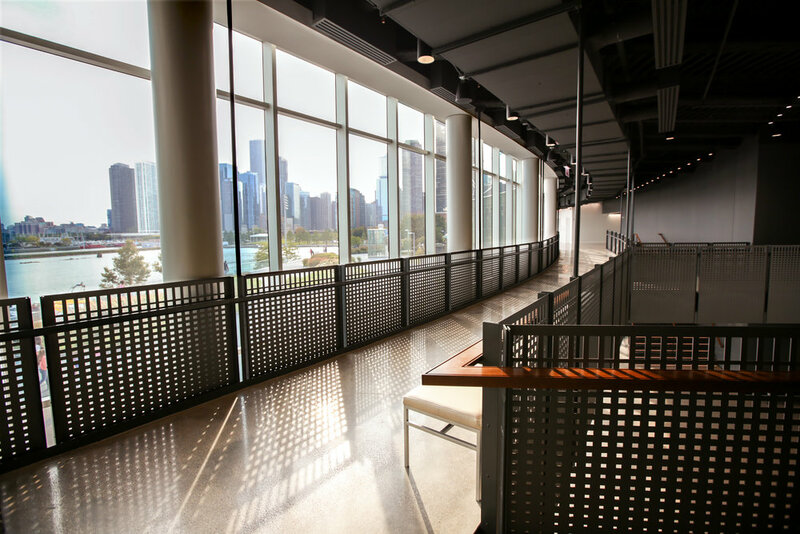 For an audience, the flexibility of CST's “new” space is nearly imperceptible: you go to the pier, park in the same place you are accustomed to at Chicago Shakes, and proceed to the same box office. With cheerful ushers directing you, you might not notice that at one show you may enter one door, but the next sends you up a stairway to a different entrance. Every time you enter, it’s a different style of theatre from proscenium to cabaret. But it looks like it’s been there forever, so you go "Oh" and forget it once the show starts. The theatre is the setting for the story that is told. As it should be. But for a theatre tech geek like me, I wanted to know more about this innovative, game-changing theatre concept. The sleek design belies the amount of engineering problem solving and creative process that went into designing and building a new theatre structure inside of essentially a tent. As the CST staff gets used to driving their new Tesla of theatres, the flexibility will open up more possibilities for new kinds of work to come to life. Already, the tent surface itself provides a compelling blank canvas for projections. 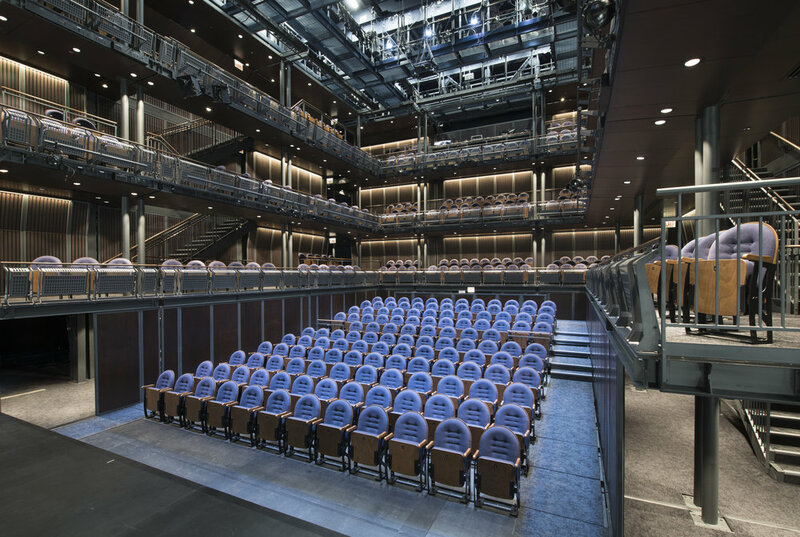 In the 2017/18 Season, Chicago Shakespeare Theater’s flexible new venue The Yard at Chicago Shakespeare, which has seating capacities ranging from 150 to 850, joins the Theater’s existing spaces—the 500-seat Courtyard Theater and the 200-seat black box theater Upstairs at Chicago Shakespeare—to create a dynamic theatrical campus on Navy Pier, shown in cutaway. 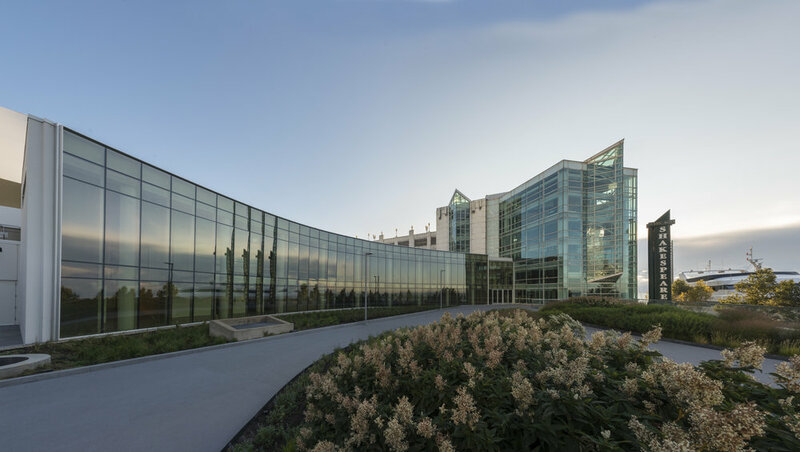 Image courtesy Chicago Shakespeare Theater / Adrian Smith + Gordon Gill Architecture. Chris Plevin, longtime director of production at Chicago Shakes, was involved in the process of creating the space. It is clear from his recounting of conceptualizing and actualizing the new venue that the team utilized the same type of creative process that artists use to develop new performance works. Except in this case, half of the team were engineers, architects, and zoning and code compliance folks, not just designers and directors. Almost everything about the theatre had not really been done before to this scale. Putting a new building on an old pier has a host of structural engineering issues even if it’s not a theatre. The entire adventure was a kind of “Yes, and...” improvisational exercise that resulted in bricks and mortar. Or steel and concrete. As the space comes online, new questions must be asked when booking the season. Never before has an artist been asked: what kind of space do you want to play in? What kind of sightlines work for your piece? At last count, there are nine approved configurations. This will require a longer timeline to develop future concepts and productions and will allow for work that could not be created before. But as Plevin said, the set up is the same as any show. He was most surprised at how the coupling of the seating towers to the building shell happens, and he notes that all stage hands respect the scale of the changeovers—they are essentially reconfiguring the inner structure of the theater, not just set pieces and drops. It’s physically exhausting work, but like all stage workers, they have immense pride in their work and excitement about the space. Not to detract from the phenomenal performances taking place in the space, but make it your New Year’s resolution to honor the spaces where Chicago artists make the magic happen: there are artists in that process too! The Yard is located on Navy Pier at Chicago Shakespeare. For tickets and information to shows occurring there, go to www.ChicagoShakes.com or call 312-596-5600. To take a tour of the theatres on the Pier at the Chicago Architecture Foundation website. The Yard at Chicago Shakespeare. Photo by Liz Lauren. The Yard at Chicago Shakespeare. Photo by Vito Palmisano. The Yard at Chicago Shakespeare. Photo by ©James Steinkamp Photography. The Yard at Chicago Shakespeare. Photo by Chuck Osgood.